Cleyera japonica, the sacred tree of Japanese Shinto. depicting a "sacred tree; divine tree". Branches of the Sakaki tree are decorated with paper streamers (紙垂　shide) to make ritual purifying wands (玉串　tamagushi).
. sakaki さかき【榊】 sakaki tree, Cleyera japonica . imiki, imi ki 忌み木 "taboo tree"
. imi 忌み / 斎み imi - taboo . in the context of Shintoism. There are other trees of this kind, where deities come to reside during their travels in this world and the other. 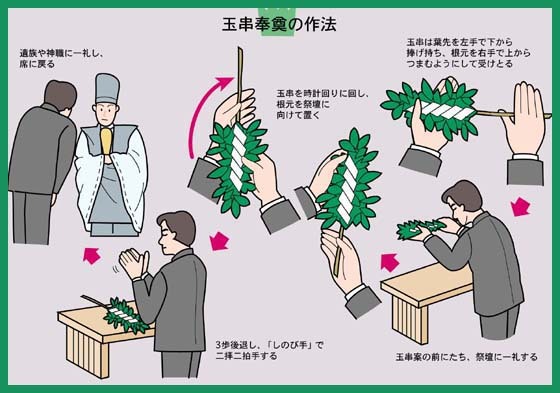 The proper way to make an offering of a Tamagushi at a funeral. 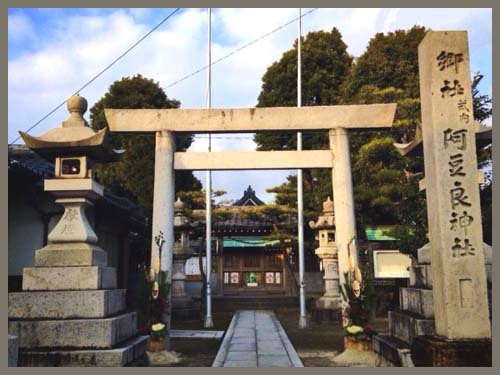 There are also various shrines with the name Sakaki Jinja 榊神社 Sakaki Shrine in Japan. In 揖斐郡 the Ibi district someone threw a Sakaki branch from the Shrine 上花長神社 /花長上神社 Hananagakami Jinja and it flew all the way to Ichinomiya town to the Shrine 阿豆良神社 Azura Jinja, where it took hold and begun to produce blossoms. A pilgrim to the Ise Shrine had forgotten a parcel on a rock where he had rested. A villager found it and threw it away. But on the next morning it was back on the rock. This continued for a few days. When he finally opened the parcel there was a Tamagushi inside. Now the family of this villager made the rock their ritual prayer place and venerated the Deity. Later a member of the family split the rock with a chisel, and red blood begun to flow from the rock. This rock begun to grow little by little every year and soon was as high as the house. It was the Ishigamisan, Ishigami San 石神さん Divine Rock Deity. At the temple 安養寺 Anyo-Ji when someone tries to cut the Sakaki tree, he will become a terrible stomach ache. 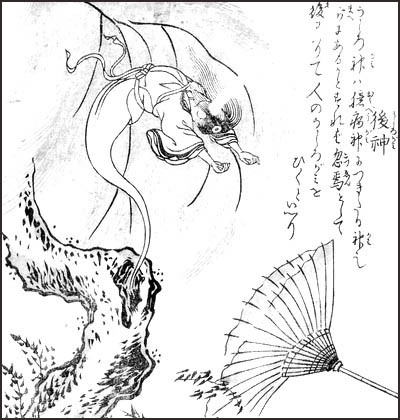 During the time of the 明治維新 Meiji Restoration a man with a wild temper tried to cut the tree with a sickle, but from the cut red blood begun to flow. The man cried out loudly and held his body in a strong stomach ache. Once there was a fire at 伊勢神宮 the Grand Ise Shrine around 1825. Suddenly the door of the shrine 荒祭宮 Aramatsuri no Miya opened all by itself. At the 外宮 Geku a Tamagushi begun to bear fruit. Once out of the Tatami mats of the gate there grew a special rice plant with an abundant crop in autumn. It was seen as an auspicious sign for the realm. Sakaki Jinja 榊神社 Sakaki Shrine. During the Sakaki Matsuri 榊祭 Festival, 榊様 Sakaki Sama make a line and walk through the village. When they reach the home of a villager who is thought to be bad by others, they stop and try to enter the home by force. A home where Sakaki Sama has entered will have a death in the family soon after. During the rituals for the New Yeara Sakaki Tamagushi is used and then placed at the entrance to the village to protect the place and hinder the deities of disease and misfortune to come inside.
. senzo no misaki 先祖のミサキ Misaki for the ancestors . just like the ones used by attendants during morning cleanings. 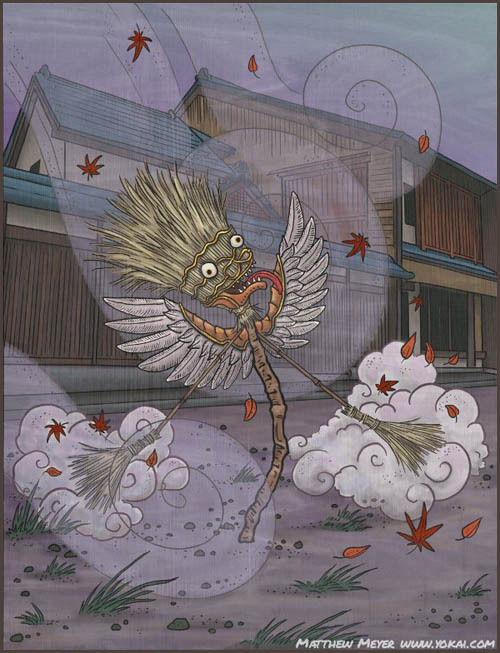 A hahakigami is a tsukumogami which takes up residence in a broom. They can sometimes be seen on cold, windy late autumn mornings, sweeping wildly at the blowing leaves. Long ago, brooms were not household cleaning tools, but actually holy instruments used in ritual purification ceremonies. They were used to on the air in a room or area in order to purify it and sweep out any evil spirits and negative energy that might be lingering there. Like any tool used for many years, a broom which reaches a very old age becomes a perfect home for a spirit — perhaps even more so in the case of a hahakigami because of the ritual nature of its origin. are used also as magical charms for safe and quick childbirth. Because brooms are used to “sweep out” evil energy, a hahakigami acts as a sort of totem to “sweep out” the baby from its mother safely. They are also used as charms to keep guests from overstaying their visit. Anyone who has stayed beyond their welcome might also be “swept out” by the power of the hahakigami. A mother has to sweep the floor with a broom or stamp on the broom forcefully to have a safe birth. Women who did not take good care of their brooms often had a difficult birth. Hooki no Miya 箒の宮 "Shrine of the Broom"
. ubugami 産神 "deity of birth" . Hokigami is the first to show up during a birth. If he does not show up, a woman can not give birth safely. Sp she has to take good care of her broom. He comes instead of Hokigami to help with a birth. It has the figure of a very large monk and appears on crossroads and in the mountains, to take people by surprise. Hokigami is the Deity of Birth. If a woman walks over a broom, she will have a difficult birth. The same is told in Ehime 愛媛県. There are various tales and lore on the topic of giving birth. A woman has to go to a special hut for giving birth, there a broom has to stand up to make sure the Hokigami will come to help. If the pregnant woman steps on the broom by accident, the Hokigami will get angry and she can not give a safe birth. If the bottom of a newborn baby is blue, they say the Hokigami has blown it out. If Hokigami and Benjogami (Deity of the Toilet) do not show up in time, a woman can not give birth. Therefore a woman has to keep the toilet clean too.
. Benjogami 便所神 God of the Toilet . To help with an easy birth, people weave a basket of material from a broom and put a knife into it. If Hokigami does not show up, a woman can not give birth safely. Hokigami is the same as Izumo no Kami 箒神は出雲の神 and is the first to show up during a birth. If a woman takes good care of her broom, she will have an easy birth. But if not, five days after giving birth, a 河童 Kappa in the form of an old grandpa will snow up and take the baby away to its death. These three deities show up for a birth. So women have to venerate them every day to get their help when they need it. The toilet has to be kept especially clean, especially by pregnant women.
. Yōka 八日様 Yoka Sama, the Honorable Day Eight . a 乞食 poor beggar woman gave birth to a baby girl under a bridge. A person passing over the bridge heard the Deity of the Broom and the Deity of the Toilet talking, saying that whoever would get married to this girl would become the richest man in the village. So this girl was lucky, got married and lived to a long and rich life. Once a traveling businessman stayed over night in a temple of 荒神様 Kojin Sama. There the Hokigami came along and invited Kojin Sama to come and assist with a birth tonight, but Kojin Sama refused. The Hokigami went alone to help. When he came back he told that the child had been born safely, but its life would be short, because on this and that day a Kappa (Enko エンコ) would come and get it. The businessman thought this was about his own child. On the day when the life of the child was supposed to come to an end the child went to the river with her old nurse. But the nurse was in fact the Kappa, took the child by the hand and wanted to jump into the river. Just in this moment the father gave a loud ring with a sacred bell. 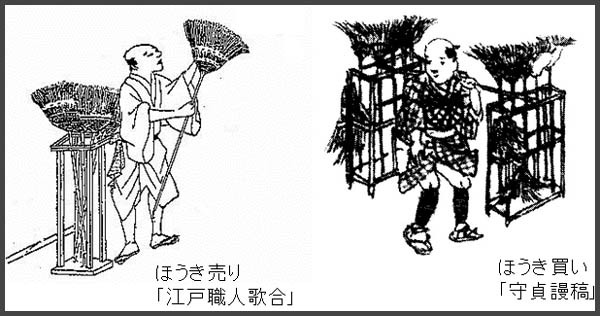 So the Kappa fled in haste and the child was saved.
. Aragamisama, Koojinsama 荒神様 Kojin Sama .
. shuro hooki 棕櫚 ほうき broom made from Shuro palm . It was truly a recycle society. Okayama prefecture has quite a lot of Misaki legends.
. Misaki ミサキ / 御先 / 御前 / 御崎 The Misaki deity . A deity that can bring misfortune or curses (tatari-gami 祟り神). and can not leave yet to go to the Paradies in heaven.
. hokora, hokura, shi 祠 （叢祠　神庫）Hokora small Shinto Shrine . for example the Inari キツネ Kitsune fox or the カラス Karasu raven from Kumano. 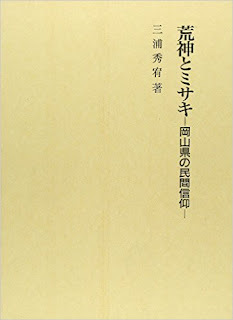 misaki daimyojin 御崎大明神 at Inari fox shrines 稲荷社 as a messenger. "Misaki of seven people" . henshi 変死 / へんし unnatural death. They have a page of their own! In Okayama there are legends from 勝山町 Katsuyama, 大石 Oishi and 有漢町 Ukan. A special deity of the Southern parts of Okayama. It is no always the vengeful soul of a person dead through unnatural circumstances, but also a protector deity, if venerated properly. 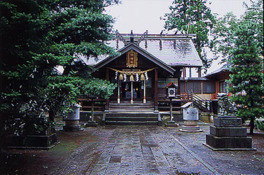 御先大明神 Misaki Daimyojin is the Misaki Deity of 吉備津神社 Kibutsu Jinja. 岩山大明神 Iwayama Daimyojin is the Jinushigami 地主神 the land god of Kibitsu Jinja.
. Kibitsu Jinja 吉備津神社 - Introduction . furo フロ (森) "sacred forest"
is a part of the forest that had become the target of faith. If a tree was cut or branches broken, that could bring great misfortune. Tobyo is a little snake with yellowish white ring-like mark around the neck. It brings good fortunes to its believers. There are some shrines dedicated to Tobyo. BTW - I live in a town in Okayama called Misaki 美咲 "Beautiful Flowering"
Misaki (美咲町 Misaki-chō) is a town located in Kume District, Okayama Prefecture, Japan. Let us look at the Tsurugi Sword Misaki first. In front of the 観音堂 Kannon-Do hall of this village there is a Misaki Hokora Shrine. Once a Rokubu pilgrim had been killed here. He had 金の刀 a golden sword of 摩利支天 Marishiten and prayed to it before dying. Since then the villagers fear his curse and built the Kannon Hall.
. rokubu 六部 Rokubu Pilgrim, itinerant Buddhist priest . At the 城山 castle mountain there is a family venerating Tsurugi Misaki. Once a priest came down the mountain toward the home of the family. He told the people that they must venerate 摩利支天 Marishiten or otherwise will be cursed. On the place where someone found an unnatural death, a Misaki ritual is performed. A tree is planted, called ミサキ様 Misaki Sama. and rituals are performed for them. 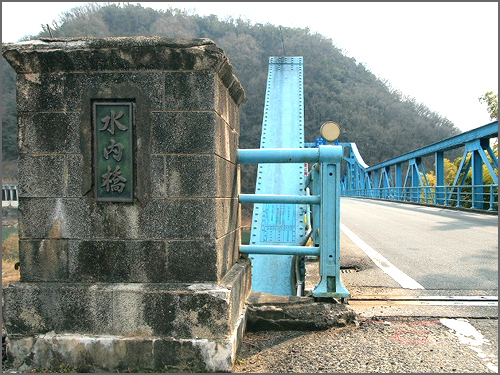 The ancient ancestors of 津山藩主森家 the Lord of the Tsuyama domain, the Mori clan, are venerated at places where their swords have been found. At the hamlet 美甘村延風 Nobukaze in Mikamo there is a grotto, where a sword is kept and venerated as Tsurugi Misaki. Once there lived a high-ranking King in this area, who's grave is in an old 古墳 Kofun burial mound, where they found a sword and venerate it as Tsurugi Misaki. In the beginning of the Mejiji period, there livend an old man who became quite infirm and finally committed suicide by hanging himself. For more than 6 months after that many strange things happened in the village, so the villgers planted a cherry tree in his honor and venerated it as his Misaki soul. Since olden times, old trees are venerated as Misaki. The 山の神 Deity of the Mountain - Yama no Kami, is also seen as Misaki. If a person is posessed by a Misaki, exorcist rituals have to be performed. If someone has killed himself by hanging, or has died from starvation, he becomes a Misaki and to prevent him from becoming a bad ghost, people prepare a funeral and grave for him with great care. 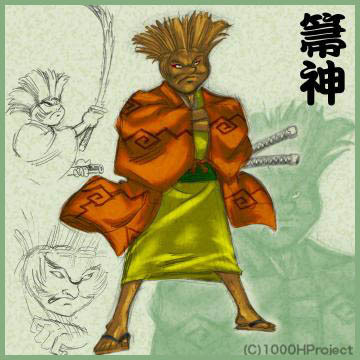 gedoo ゲドウ Gedo is a Yokai of Western Japan and Shikoku. It looks like a weasel (itachi). In the compound of the Kawabata family is a special Misaki for daily venerations. Once year there is also a ritual for the Guhin Tengu, who is living in the 天狗岩 Tengu boulder. 50 years after an unnatural death the wandering soul will finally come to rest as a Misaki. It might also become a Jizo Gongen, a deity venerated at Mount Atago.
. Jizoo Bosatsu 地蔵菩薩 Jizo Bosatsu - Kshitigarbha . In the hamlet of 落合町吉 Yoshi there is a Furo sacred forest right close to the fields. 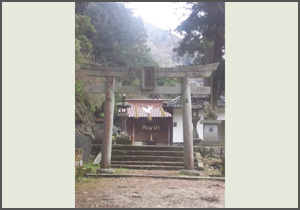 A small Shinto sanctuary for Misaki in the forest, for the ancestors. The forest is made of sasaki 榊. People are not allowed to break any branches of the trees in this forest. If they venerate it properly, the deity will protect the hamlet. If they forget to venerate it, they will be scolded.
. 榊 - the ritual Sasaki tree . Many people in Ochiai have a small Hokora for Misaki, who is venerated as a 屋敷神 Yashikigami Protector deity of the Estate, near the North-Western side entrance.
. yashikigami　屋敷神 "estate deities" . Near the main entrance of an estate in the field a natural stone is burried in the ground, and a small Hokora erected as Misaki Sama. 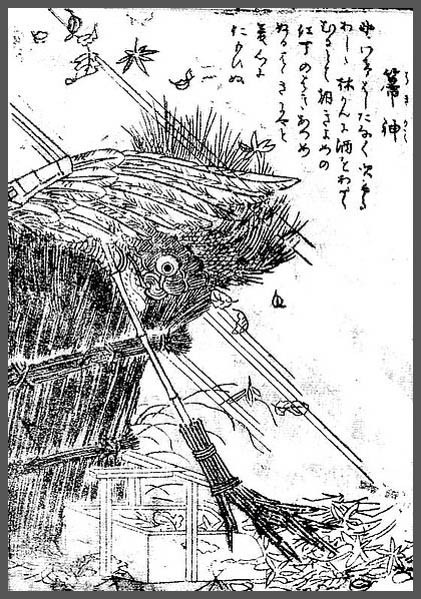 A man from an old family once shot at an 大鷲 eagle who was resting on the Tengumatsu 狗松 Tengu Pine. He thought he had hit the animal, but it spread its wings and flew away. This hunter developed a high fever in the same night. 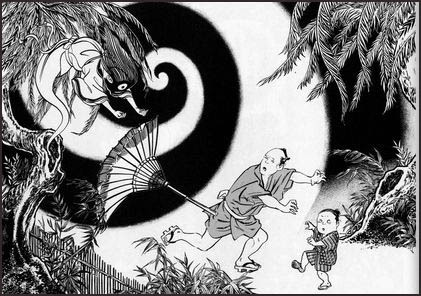 An exorcist told him that the animal was in fact the Tengu from the nearby Misaki. The man eventually became crazy and died and his family line came to an end. At the Misaki Shrine in the village of 落合町栗原余河内 Ochiai there is a Tengu mask as protector deity. 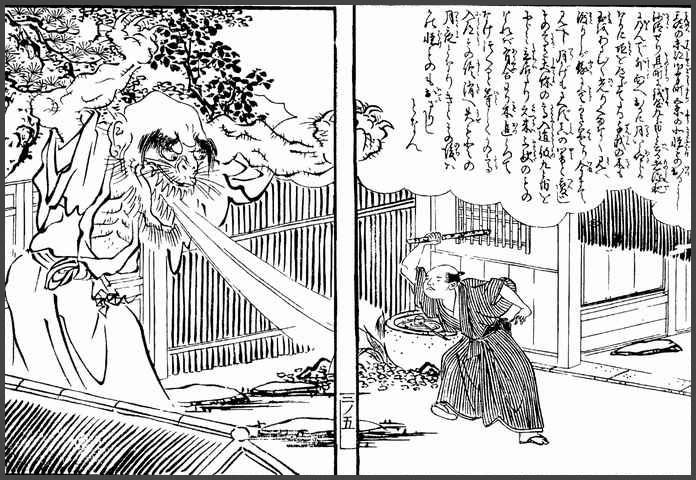 If an evil person or someone with bad intentions or a woman approaches the mask, the Tengu will throw that person down the hill. 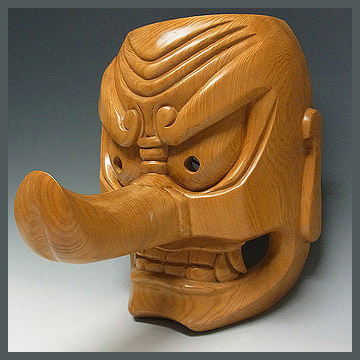 On the other hand this Tengu protects the village and begins to "sing" to alert the people when a danger or problem is headed for the village.
. Tengu no men 天狗の面 mask of a Tengu . Along the embankment of the river near the bridge 水内橋 Mizuuchibashi is a Misaki Hokora to protect the waterways from accidents. The shrine is located along the river 高梁川 Takahashigawa. Fishermen come here to pray before they go to sea. Here the 水神 Deity of Water is united with the Misaki Deity. 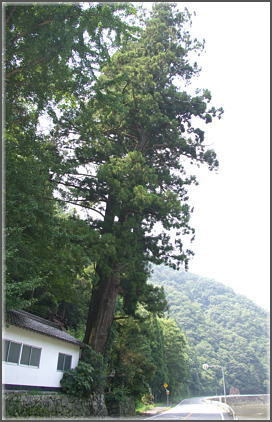 This shrine is famous for its old cedar tree, 御鋒神社の古杉 furusugi. This tree is more than 1000 years old. The tree may also be called Kosan 「古杉」「こさん」- Old Cedar. In 石島 Ishijima a lost soul with no one to appease is called Misaki. If it bewitches and posesses someone, his is "pulled along by the Misaki" (ミサキがひっぱるmisaki ga hipparu ). Once an old man suddenly disappeared one evening. Although he was blind, he climbed up a steep cliff. When people saw this, they knew he was pulled along by Misaki. For a lost soul rituals to "cut them off" (ミサキギリ misakigiri, misaki-giri) are performed about three months after an unnatural death, caused by being posessed by a Misaki. misaki no michi kiri ミサキのミチキリ "Cutting off the road for a Misaki"
Priests from a temple in Yakake are sometimes called to 真備町 Mabicho to perform rituals of Michikiri. misaki osame ミサキオサメ "ending a Misaki curse"
At 矢掛町西川面 Nishikawamo there are ofteh accidents of all sorts, especially drownings. To get rid of the curse of a Misaki, people from families of diseased persons come together to have an exorcist perform rituals of Misaki Osame. People belonging to a Misaki worship group (ミサキの氏子 misaki no ujiko) are prone to become insane. 94 - not all include the word "ミサキ misaki" in the text.
. Okayama Dialect and Deiteis .
. Koojin sama, Aragamisama 荒神様 Kojin Hearth Deity . A female Yokai with a long neck and only one eye. She appears suddenly behind a person and pulls the hair, hence the spelling with the Kanji for hair, 後髪. So maybe the spelling with "deity" 後神 is just a pun. 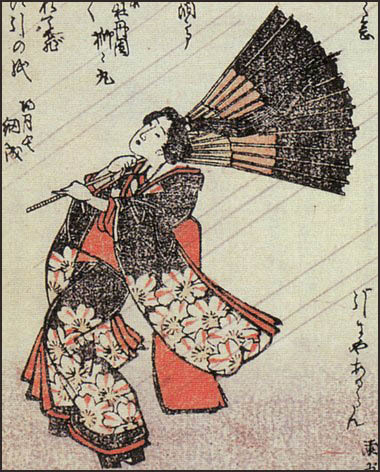 Other later images show a lady with the hair or an umbrella blown back, but not a Yokai. 井原西鶴 Ibara Saikaku ( 1642 - 1693) describes her as a deity venerated at the Grand Shrine of Ise 伊勢神宮 in Mie. If a parent wanted to dis-inherit his child, she would come and stand behind him and make him change his mind. 水木しげる Mizuki Shigeru thinks the two are not related. 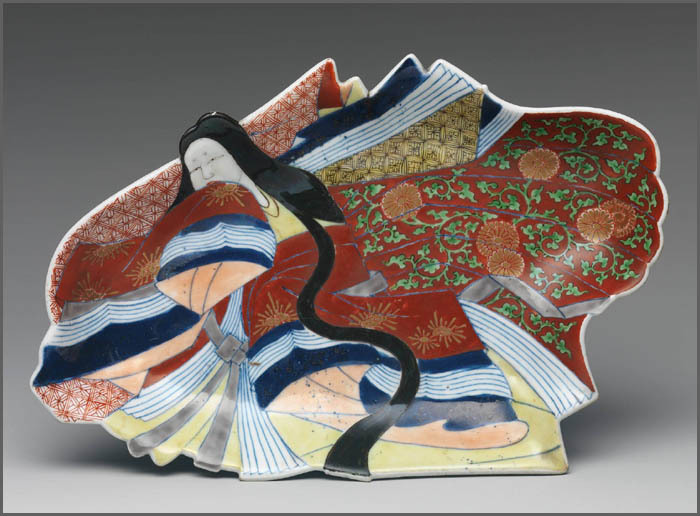 The stories told about the deity 後神 Ushirogami in the Tsuyama region of Okayama are about a timid lady who had to walk on a dark road at night, when Ushirogami appeared and disshevelled her hair, blowing her breath like fire on her neck. Sometimes she blows so hard that an umbrella blows away, or she touches the neck with ice-cold hands or very hot things.